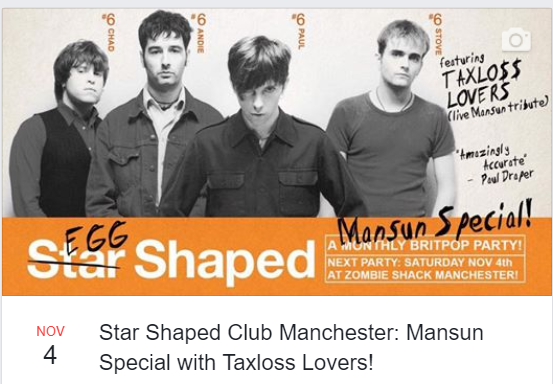 MANSUN SPECIAL AT STAR SHAPED CLUB MANCHESTER THIS SATURDAY! The Star Shaped Club Manchester have a Mansun Special this Saturday night, featuring the premier Mansun tribute band, Taxloss Lovers: a tribute to Mansun! The Mansun night will be in full swing from 22:00 on Saturday 4th November until 3:30 on Sunday morning at The Zombie Shack, 50 New Wakefield St, Manchester M1 5NP. Tickets cost just £5 and are available HERE .